At Servals our dream is to design a stove that works on 100% Plant Oil. having designed the Kerosene burner that contributes to the cause of kerosene consumption, our next big goal is to totally eliminate the use of kerosene itself. This would be a first-of-its-kind in the world. It has international ramifications too because all developing countries would benefit from this. The product is designed to use unrefined vegetable oil from jatropha seeds. Jatropha is easily available but there’s no suitable stove to use its oil for domestic purposes. So far we have designed a prototype. We collaborated with Delft University, Netherlands to design the prototype. 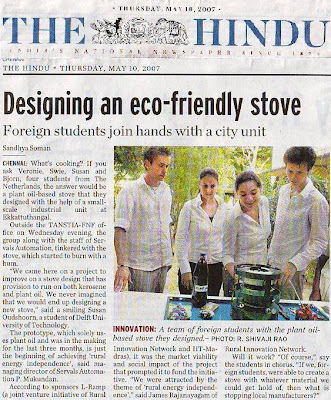 Read here about the Hindu coverage of the Plant Oil Stove prototype. We are now working on further refinement of the design. The current design burns for 2 hours and then tends to clog up with carbon deposits. We are working towards making it run for 10 hours continuously. Rockerfeller foundation, under their innocentive porgram are helping us with this problem solving. Besides providing a clean and alternate fuel source, we also think the whole concept of plant oil usage will open up avenues for creating what I would like to call - the "rural energy entrepreneur". This concept will generate job opportunities among the rural masses by roping them in to crush jatropha seeds and produce oil. Write to us here. We would greatly benefit from your thoughts, knowledge and information.